The day's developments surrounding the financially challenged airline came after it cancelled even domestic flights, leaving passengers stranded at various airports. Even the airline's unpaid employees were upset, which led to an employees' association asking the Mumbai Police to register a case against the company's founder and former Chairman Naresh Goyal, Chief Executive Officer (CEO) Vinay Dube and State Bank of India (SBI) Chairman Rajnish Kumar. In New Delhi, the Director General of Civil Aviation (DGCA) and Civil Aviation Secretary Pradeep Singh Kharola met PMO officials towards the evening to update them about the situation of the cash-strapped airline. He said that currently Jet Airways is operating only 11 planes and has suspended its international operations till Monday afternoon. The All India Jet Airways Officers & Staff Association in its letter to Mumbai Police said: "We call upon you to register offence under cheating, criminal breach of trust, misappropriation and other offences against the Chairman, the CEO, the representative of the State Bank of India (Bankers) as per specific provisions of Section 405 and 409 and other related Sections including 420 of the Indian Penal Code." 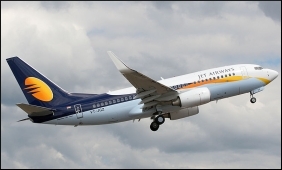 The association urged the Mumbai Police to investigate the matter on an urgent basis and said that the Jet Airways staff will be forced to express their solidarity through constitutional means, including "calling for a strike under the provisions of Industrial Disputes Act". Besides the employees, the airline's aircraft lessors too are upset with the current financial situation, with some of them requesting the DGCA to de-register their aircraft leased to the company. The de-registration request section on the DGCA website showed on Friday that lessors have applied to de-register 19 aircraft owing to unpaid dues. However, some lessors have also withdrawn their de-registration requests. The latest developments came on a day when the submission deadline for expression of interest (EoI) bids from prospective buyers for a stake sale in Jet came to an end. At present, the airline owes over Rs 8,000 crore to a consortium of lenders led by the SBI.